Kolkata, Oct 24 (IANS) With all tickets for the relocated England-Brazil Under-17 FIFA World Cup semi-final lapped up by fans, a capacity crowd of 66,600 is expected when the football giants lock horns on Wednesday at the Vivekananda Yuva Bharati Krirangan. Football buffs, who logged in to the ticketing section of the official website FIFA.com on Tuesday for buying the e-tickets, were heartbroken to find the two words “sold out”. The frenzy for tickets had started soon after world football governing body FIFA on Monday shifted the match to VYBK from Indira Gandhi Athletic Stadium, Guwahati, due to poor ground condition after days of heavy rainfall. FIFA also announced that tickets would only be available online. While 20,000 netizens had registered at the site at 7.15 p.m., over an hour before the scheduled start of sales at 8.30 p.m. on Tuesday, the number of registrations crossed a whopping 1.50 lakh in the first three hours. Fans had to endure a waiting time of more than an hour after logging on to the site, as the ticketing window for the match opened in short spells of ten minutes. The number of ticket seekers swelled with every passing minute, and the tickets got exhausted sometime after midnight. Incidentally, VYBK – the largest stadium in India – has a sitting capacity of 85,000. Due to security and logistical reasons, the capacity has been reduced to 66,600 for the FIFA U-17 World Cup. FIFA has also announced that while fans who had purchased tickets for the Guwahati encounter would be entitled to a refund, they “will also have priority access to purchase tickets for the Kolkata semi-final”. 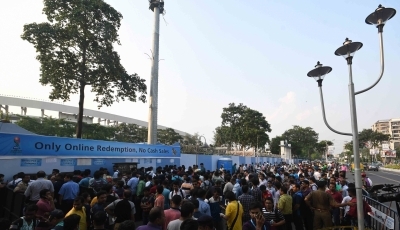 The fans eager to come to Kolkata have been advised to carry online proof of purchase to the dedicated ticket counter for Guwahati customers, and buy a ticket. “Around 17,500 tickets were sold to the public in Guwahati. We have kept provision for those who wish to come to Kolkata to watch the game. They won’t face any problems,” said Local Organising Committee (LOC) project director Joy Bhattacharjya.